#2-15 Exceptional Brunswick antique pool table of ribbon mahogany. Extensive inlay of ebony, holly and mother-of-pearl. 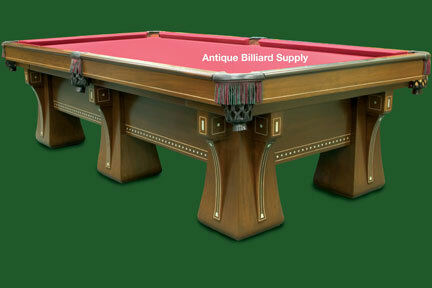 Classic design from the early 1900s provides massive appearance perfect for a private billiard room. Rail tops of Brazilian rosewood with round sights. Nine-foot size with extra thick three-piece slate playing surface. Restored and available for sale.